They say a picture is worth is thousand words, well how about a video - maybe millions? Here our congregation sings Till We Meet Again in the sanctuary at lovely Rutgers Presybterian Church, our home for nearly forty years. Another St. David's Dinner Success! Here are some images from our latest St. David festivities - and a good time was had by all! Da iawn! - Beat eggs in bowl, set aside. - Combine the rest of the ingredients. - Add in - at first - 2 1/2 eggs. If it is too dry add the rest. If you put it all in initially it may be too wet. - Add flavoring to taste: cinnamon, nutmeg, currants, cranberries, lemon, orange, whatever takes your fancy! - If you use a 2 1/2” cutter, this recipe will make about 40 cakes. One of the Welsh Congregational Church’s long time members, Jean Williams Peetz, died February 16, 2018. She was 96 years of age. I came on the scene to the Welsh Church in the early 1990’s. I remember her as an intelligent woman; good-natured, dedicated, capable and proud to be Welsh. She was a great support to the church not only financially but served as the Head officer of Communion, on the Finance Committee, and Treasurer. Of course, she was a member of the Welsh Council as well as active with the Welsh Women’s Club. Academically, Jean could be considered a woman ahead of her time. She had a degree in Mathematics from the University of Wisconsin-Madison, came to New York City upon graduation and worked for the Metropolitan Life Insurance Company for 40 years. She was proud of her accomplishments at Met Life. She was equally proud of being a Handwriting expert (Certified Document Examiner). A career she took up after retirement. If a document was forged she would spot it. As a young woman upon meeting Jean, I thought she was cool! She was smart, non-conventional, caring, and a sharp dresser. Jean Williams was born in Oak Park, IL on September 14, 1921 and grew up in Hibbing, MN. READING OF DYLAN THOMAS'S UNDER MILK WOOD AGAIN A great SUCCESS! This year the Welsh Congregation of New York City, along with Don Farrow's tireless efforts managed to raise well over $500 for the Rutgers Refugee Relief Fund, making this event truly a meaningful one. If you'd like to make a donation to the fund, which is at present responsible for the care of four refugee families in New Jersey, please click below. Diolch yn fawr! With the long line of readers behind him, Simon Owen-williams explains the fundraising cause to the audience, while Don Farrow, our tireless organizer of events, watches from the far right. We celebrated the life of our former pastor, Rev. Dr. Philip R. Newell through the readings of eulogies, poetry and scripture, with Colleen Kennedy, David E. Morgan, Willie-Mae Perry, Simon Owen-Williams, Caroline von Reitzenstein, Don Farrow, James W. Thomas, Thomas E. Bird and Mary Lynne Bird and Dr. Madeleine Tramm. Check out our fun photos and consider following us! We are at @welshchurch.nyc - da iawn! The Women's Welsh Club celebrates 93 years! 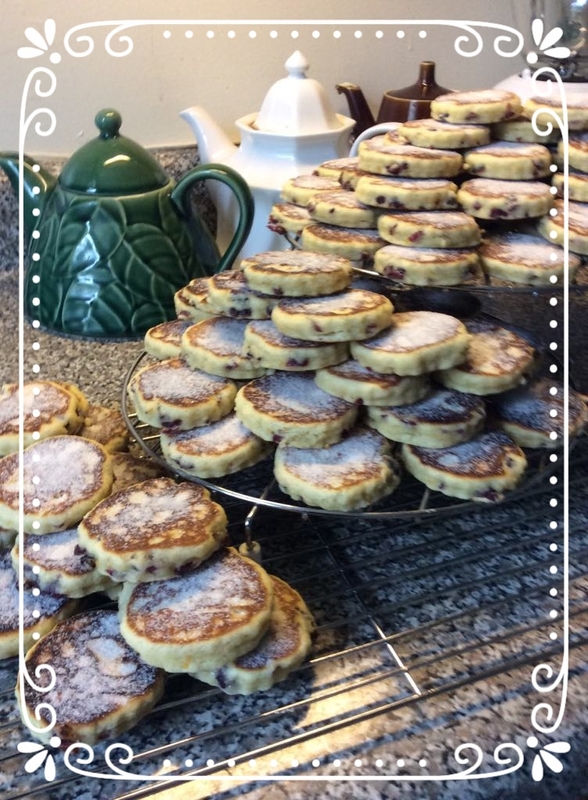 The Women's Welsh Club celebrated the holiday season with a special performance of song by James Balmer, accompanied by Mary Nelson at the piano - and along with the usual exquisite Welsh cakes and other goodies, there was a very special chocolate confection! Immediately following our Homecoming Service, our congregation and friends gathered together to share their various talents in a Welsh tradition called noson lawen. This has become an annual event, and this year's was our best yet! Many thanks to Don Farrow for arranging the afternoon fun. CONGRATULATIONS TO OUR WELSH CAKE BAKE OFF WINNER ROSALYND JOHN! 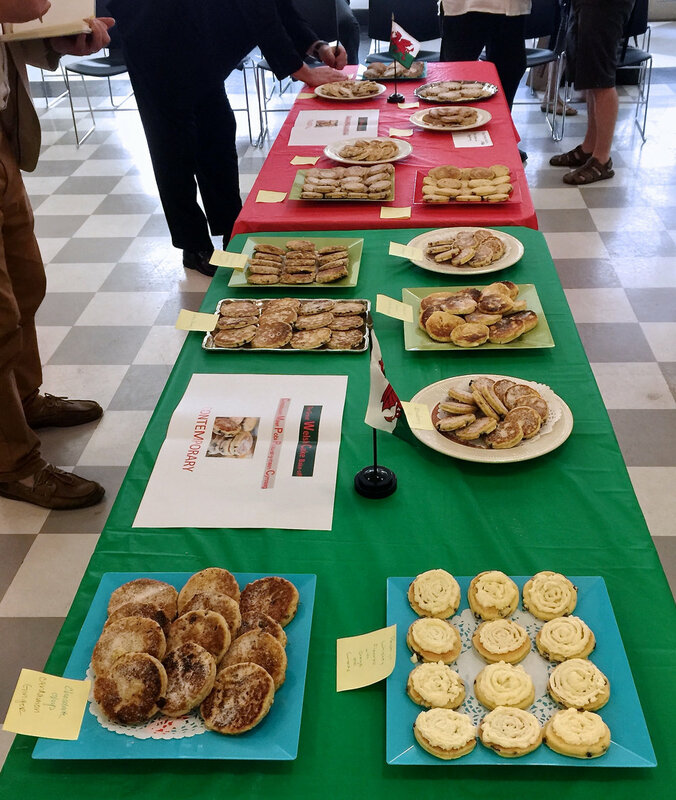 Immediately following our June worship service we conducted our first annual Welsh Cake Bake Off Challenge, where there were a total of fourteen entries in two categories! The judges were Dr. Rev. Matthew P. Harrington and Simon Owen-Williams, who chose Rosalynd John's Welsh cakes for both the tradition and non-traditional categories! The overall winner was her non-traditional lemon blueberry Welsh cakes, which had the judges swooning! OUR ANNUAL ST. DAVID'S DINNER A SMASHING SUCCESS! Don Farrow eating a sandwich while being serenaded by violinist Susan Mitchell - before the throngs come in! Full panorama with a peak into the kitchen! Rev. 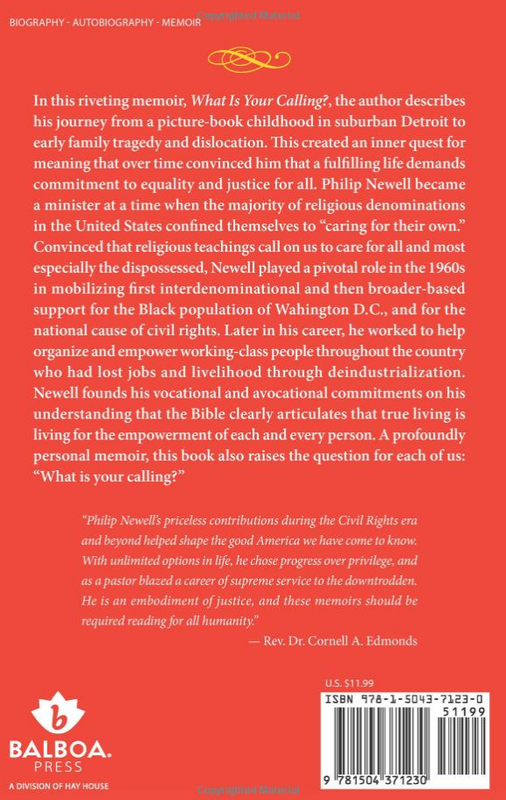 Dr. Philip R. Newell, who was our longtime pastor at the Welsh Congregation of New York City until his retirement last year, has penned a book called, What Is Your Calling? : A Memoir, published by Balboa Press. Always with much wisdom and love to share, we congratulate him on this most impressive accomplishment! Please click here to view excerpts and various purchasing options. An annual tradition hosted by the Welsh Congregation of New York City, our latest reading Under Milk Wood took place on Sunday, February 12th, and attracted a larger audience than ever! The community read was a big hit despite foul weather that reduced the mammoth cast from 32 down to 27. Well done, everyone! And a hearty congratulations to Don Farrow for his tireless efforts with getting everyone organized. JUNE BALLINGER DELIVERS AN AMAZING PERFORMANCE! 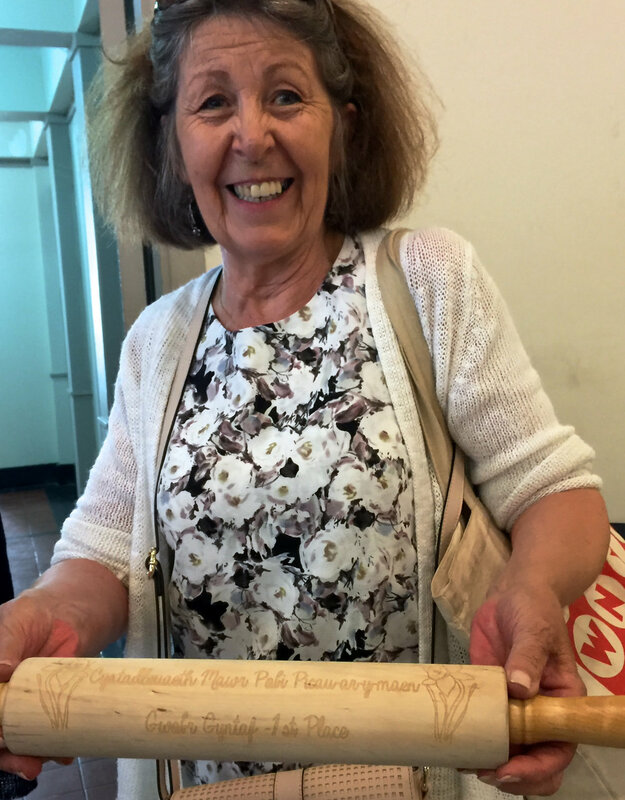 Hosted by the Women's Welsh Club, June Ballinger gave a wonderful one-woman show about a remarkable woman who worked at Bletchley Park to break the code, which helped to bring about the end of World War II. The event took place on February 4th, to a packed house - and many were brought to tears by this moving performance. October's Noson LAwen a huge HIT! Our annual noson lawen (roughly translated: happy evening) transpired on Sunday October 9th, after the service. We extend our hearty thanks to all of our participants, our emcee, Simon Owen-Wiliams, and most especifally to our fearless leader, Don Farrow, who makes these wonderful events happen seemingly on their own - diolch yn fawr!! A very special service indeed took place as the folks from Welsh channel S4C came to record for an episode of Rhys Meirion Duets (Deuawdau Rhys Meirion)! Rhys invites Welsh guest singers to sing duets with him and his guest on September 11th was the incomparable and beloved Iris Williams. They sang a lovely a rendition of Calon Lan. There were interviews with members of the congregation during the Te Bach afterward which were also be filmed. We braved the weather and despite the predictions of rain it was dry for the duration of the picnic. There were Welsh cakes, sausage rolls and lots of music thanks to our three guitarists Simon, Tom and Doug...all we were missing was a charabanc. Two highlights of the event were an impromptu recital of a Dylan Thomas poem to improvised guitar. And the appearance of a couple from Anglesey who were visiting the Imagine mosaic and spotted our Welsh flag from a distance (thank you, Simon!) and came over to say hello. It was a jolly mix of old, familiar faces and some new faces too. Longtime friend of the Welsh Congregation, Nancy L. Williams passed away quietly at home. No arrangements have been announced. Caroline von Reitzenstein's beloved son, Paris has died in an accident. Friends and members who attended the December 13th Advent Service may remember Paris who attended worship as well the te bach and Carol Sing after the service. The congregation hosted a memorial for Paris at the January gathering of the Welsh Congregation of New York City. The Rev. Dr. Philip R. Newell returned from his retirement to give the homily and offer the prayers. David Morgan provided worship leadership and worked out the order of worship and Mary Nelson directed an extraordinary music program. Welsh Congregation of New York City Worship Service and Memorial for Paris Alexander Ionescu, January 10, 2016. Leadership provided by David Morgan, Caroline von Reitzenstein, John Leech, Gigi van Deckter, Sanford Pelz, Andrew Fanelli, Jonathan Sutak, Lola Kramer, Mitch Swensen; musical direction by Mary Nelson; musical presentations by Bolai Cao and David Kelso. Two term President of the Welsh Congregation Church Council, Cynthia Davies recently performed at the famous Apollo Theater in Harlem as member of Breathless Choir. The choirmaster was none other than the internationally acclaimed Gareth Malone, and, yes, he has Welsh roots: his grandmother is from "Breathless" because all eighteen members of the choir suffer from severe breathing difficulties. The Breathless Choir includes two first responders from September 11th who suffer chronic breathing difficulties and other debilitating illness since exposure to the toxic dust of the World Trade Center disaster. Cynthia has managed a condition called Bronchiectasis for 35 years (as well as a very full time career as an art teacher.) She now requires oxygen on exertion, which gave her the opportunity to receive instruction from the most famous choirmaster in Britain, and the chance to return to the gym and something she always loved, singing. It was an unique and gratifying opportunity. Cynthia, a fluent Welsh speaker is from Ammanford in Carmarthenshire in Wales, and has been a member of the Welsh Congregation since 1983. More about Breathless Choir from the British press can be found here and here. A video was launched on November 14, 2015 for Chronic Obstructive Pulmonary Disease Day to create awareness of COPD, which can be seen below. Cynthia has also been invited by BBC Radio Cymru's Shan Cothi to talk in Welsh about her experiences with the choir.